Posted August 8th, 2009 by Lack-A-Virgin Hey! This week, we’ve all been seeing red. The NOH3 Red Skirt Run on Monday. RDR Expo at Ernst Cafe. VooDoo Red Skirt Run on Thursday. Red Dress Pre-Lube on Friday. 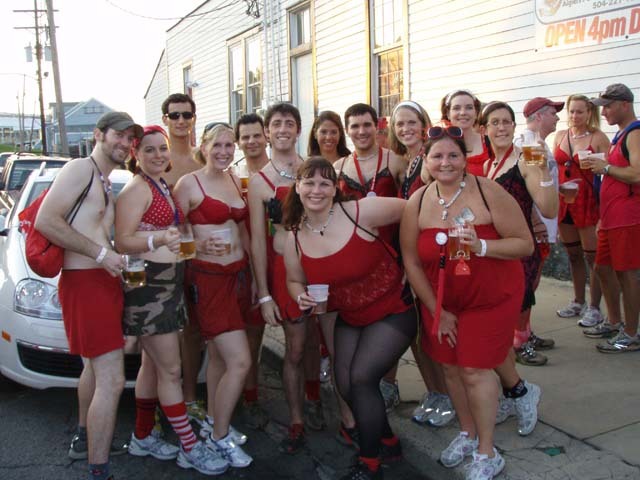 If you were anywhere near New Orleans’ French Quarter or the Marigny this week, then it is impossible that you haven’t seen people in red dresses. This has been a record breaking marathon of debauchery, and we haven’t even climaxed yet. The crazy red drunks started coursing through the quarter on Monday night and the flow hasn’t ebbed yet. We’ve run up and down Bourbon Street, we’ve criss-crossed through Frenchmen, and we’ve trampled the CBD. We invaded bars throughout the area, we were served beer by the NOLA Brewing guys, we consumed countless pizzas, and we hopped on a ferry and rode it to Algiers and back for chrissakes! We’ve disturbed the peace, exhibited rampant public intoxication, shown off all that junk in our trunk no one wanted to see, and I now know my bra size (I’m a 38A). It wasn’t easy regaining consciousness and dragging our asses out of bed this morning to do it one more time, but beer is a powerful motivator. In the immortal words of George Leigh Mallory, “Why do we drink it? Because it’s there.” Now go put on your red dresses, and we’ll see you there. It’s gonna be a blast.